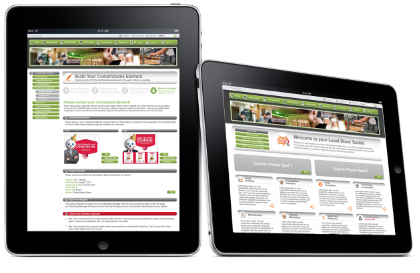 The Amplify local store marketing toolkit works on your iPad, iPhone or other compatible mobile devices. Giving you the freedom you need to create custom local store marketing programs and order off the shelf elements direct from the fulfillment house, quickly and easily whilst in store or out in the field, using your iPad, iPhone or other compatible mobile device with an internet connection. Amplify’s user friendly interface makes it easy to find and build the right local store marketing program for your immediate needs directly on your ipad or iphone from anywhere. Helping you stay one step ahead of the competition.